Pumpkin called kaddu in india is a vegetable that is well known for its health benefits. It is mostly used for preparing soups and pies. Being a good source of Vitamin C, pumpkin has antioxidant properties. It is also rich in beta-carotene, which can combat with the damage caused by UV rays and improve the texture of your skin. It can improve the production collagen, which is needed for improving the elasticity of your skin and the skin tone. It also protects your skin from the appearance of wrinkles and fine lines, and even skin cancer. Make a body mask by mixing ½ a cup of cooked or canned pumpkin puree, ½ cup coconut oil and ½ teaspoon of ground cinnamon. Apply this on your body and wash it off with lukewarm water after 10 minutes. This helps in refreshing and relaxing your skin. B Vitamins like niacin, riboflavin, B6 and folate are found in high amounts in pumpkin. Niacin is good for treating acne as it improves blood circulation. Folate also increases circulation and thus improves the renewal of cells and cell turnover. Take 2 teaspoons of cooked or canned pumpkin puree and mix it with ½ teaspoon of honey, ¼ teaspoon of milk and ¼ teaspoon of heavy whipping cream. Apply this on your face, taking care to avoid the eye area. Wash it off with lukewarm water after 10 to 15 minutes and then apply a good quality moisturizer on your face. This pack helps in exfoliating your skin and also nourishes and conditions your skin. 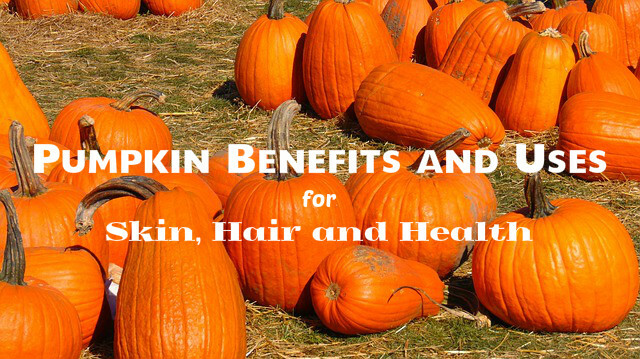 You can treat dark spots on your skin with pumpkin. Make a face pack by mixing 1 tablespoon of pumpkin puree, 1 teaspoon of honey, 1 teaspoon of ?Vitamin E oil and 1 teaspoon of lemon juice, and apply this on your face. Wait for 30 minutes and then wash it off with lukewarm water. Using face pack made with pumpkin is an excellent way to treat oily skin. Mix 1 tablespoon of pumpkin puree with 1 teaspoon of apple cider vinegar and apply this pack on damp face. Leave it on your face till dries and then you can wash it off with lukewarm water. Follow it up with a moisturizer that is suitable for your skin type. Take 2 cups of chopped and cooked pumpkin and 1 tablespoon of yogurt and blend them well to make a puree. Now add 1 tablespoon each of honey and coconut oil to it and make a smooth mixture. Apply this mixture on damp shampooed hair and wash it off after about 15 minutes. This acts as a good hair conditioner. Minerals like potassium and zinc are found in high amounts in pumpkin. Potassium keeps your hair healthy also helps in improving re-growth of hair. Zinc is needed for maintaining collagen and therefore has a role in increasing the growth of hair. Folate in this vegetable is good for increasing the hair growth by improving the circulation of blood in the scalp. Being rich in magnesium, pumpkin is great for boosting your immune system and maintaining the functions of the muscles. It increases the number of white blood cells in the body and increases your immunity power. As a result, your body will be able to resist various infections like flu, cold and fever. 100 gm of pumpkin provides only 26calories. So, it is low in calorie. People on weight loss diet can consume this vegetable without any fear of gaining weight. Pumpkin has the power to detoxify your body. It helps in flushing out the toxins and wastes from your body. The medicinal properties of pumpkin help in calming the gastrointestinal tract and preventing peptic ulcer. One cup of cooked pumpkin contains 3 gm of fibre. This is about 11% of the fibre that you require daily. So, consuming pumpkin helps in proper digestion and prevention of constipation. It can keep your stomach full for a longer time and prevent you from overeating. You suffer from depression and stress when your body lacks tryptophan. Pumpkin is a rich source of L-tryptophan, which is an amino acid that can reduce depression and stress. Pumpkin also has sedative properties, which help incurring insomnia. The orange colour of pumpkin is because of the presence of beta-carotene in it in high amounts. This can lower the risk of cancer. Beta-cryptoxanthin and carotenoids in this vegetable have the power to decrease the risk of lung cancer in smokers. The antioxidants in pumpkin are very effective for protecting the respiratory system from infections. This helps in reducing asthma attacks. Consuming pumpkin is an excellent way to reduce the risk of heart attacks and strokes because pumpkin helps in getting rid of build-up of arterial deposits. Antioxidants in pumpkin can prevent atherosclerosis. It can also regulate blood pressure. Phytosterol in pumpkin is similar to human cholesterol and helps in maintaining cholesterol at a healthy level. Potassium is essential for the heart and muscles to function properly. Pumpkin is rich in this mineral. You get about 550gm of potassium from one serving of pumpkin. Adding this vegetable to your post workout snack or meal is great for providing you the required potassium. Vitamin A is essential for healthy eyes and good vision. Pumpkin is rich in this vitamin. Zea-xanthin in pumpkin protects the retina of your eyes from the UV rays. This way, age-related macular diseases in the elderly people can be prevented.